Without all the accordant fuss. Our favourite undergarment did enjoy the fruits of the new and very widespread exposure she gladly gave it but the outfits that she wore had more to do with a nod to the Renaissance period in history rather than the renaissance of the corset itself as seen and worn during her 2012 world tour. And, like learner golfers getting a great deal of pleasure from seeing someone like Rory McIlroy shank a tee shot or fluff a putt, wasn’t it reassuring to see that she, like anyone else, isn’t spared the occasional wardrobe malfunction? As aged and both culturally and historically thoroughbred as the corset may be, it can still spring a cheeky surprise on anyone. And we salute its character and never ending ability to surprise. But, as far as all things conical are concerned in the world of underwear, it really is the Renaissance period we have to look back to in order to see the dawn of cone shaped bodices with bodies to match. A period that was, as one writer has noted, one of “...padding, pulling and pushing into yet more extreme cone shaped bodices with tiny low waists”. From the late 14th century up until the early 16th century, the items of choice for the wealthy woman’s wardrobe were gowns made from an assortment of exotic fabrics, each layered on top of one another with a huge amount of padding underneath with the corsets of the time worn with petticoats that held out the skirts into that firm conical shape so beloved of Ms Ciccone. 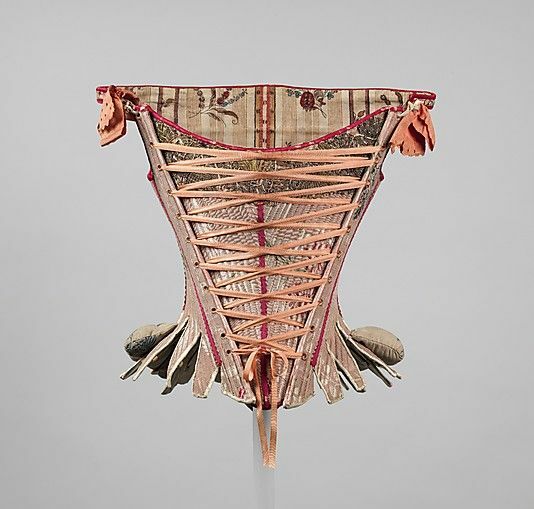 That shape remained true throughout the ages for corsets and, whilst one like this may well have adorned her as she took to the stage in New York, Paris or London, it dates from 1750. Yet who wouldn’t want to own and wear such an exquisite item right in the here and now? The lacing is big and practical-at least from the point of view of the maid who would have been expected to dress the lady wearer, the subservient point Madonna is alluding to in the video clip above. The tightening of the lace certainly resulted in women being able to maintain the desire upright posture. But it would have come at the price of barely being able to bend at the waist. Yet, lest the corset be blamed for this inflexibility, it should be remembered that much of the wearers resultant discomfort would have been due to those afore mentioned gowns and myriad other garments. These were all worn tightly together in a unholy layer, the weight added and additional heat generated by such densely packed layers the real reason for the wearers frequent discomfort and fainting fits. The purpose of layer upon layer of clothing at the time was to deliberately hide away the natural form and shape of the female body. The breasts would be strapped down and flattened whilst the curve of the waist to the bosom disguised within that geometric and unnatural shape. Is it any wonder, with women’s clothing and look at the time designed to make them look androgynous rather than feminine, that so many women were able to pass as men at the time, often serving in traditional male roles in the process. The Royal Navy of Lord Nelson’s day was known to contain many women fighting along the men-as well as living like one. The reason they might have been able to do this was partially down to the corset. Worn then as an item to hide femininity and to replace curves and subtle swellings with flat plains and angles, it was as hidden and secretive as the delights it sought to disguise. Yet, for all of that, the very great irony is that what lurked at the core of those everlasting layers of clothing was essentially feminine. Madonna brought it back into the eyes of the world and helped to liberate the corset for a new audience.